So basically, half of the month of June had me occasionally going around, just taking in the scenery, visiting old family members (some of whom I haven’t seen for some 15 years), drooling on the side as I; being left out, watched yet another meal be shared at the dinner table, and bracing myself, not for the pain from the shock of having pliers and drills up and down and all over my gums, but for those inevitable instances, when one of my aunts or uncles have the audacity to remember yet another detail about my younger self, and sharing in gruesome detail, my time in the spotlight of embarrassment for every single pair of ears around either the living room, or around the dozens of bowls and plates, bearing half-finished helpings of rice, stir fried meats, steamed vegetables, mantou (馒头) and sliced pickled cabbage (酸菜). Unmeasurable pleasure in measured indifference. Not a theme to be taken literally, of course, but I felt that it is a fitting one to describe the Chinese lifestyle that I observed. To me, nothing speaks more about this culture of mine than watching us share a meal. The communal gathering of a meal is perhaps the essence of a Chinese family, and it’s rather telling, once you start observing the behavioural atmosphere and the informal customaries around the dinner table. And so naturally, this theme’s sudden formation came from the heart of the taste of Sichuan: the hot pot (or ‘huo guo’ 火锅, literally ‘pot (or wok) of fire’). Needless to say in this instance, the term ‘hot pot’ needs to be taken literally in every sense of the phrase: it is BURNING hot, spicy and stirringly overwhelming once you start eating the food from its red-hot depths. And yes, this charming way of life of Chengdu can be observed in its most pure form, just by observing what a meal involving hot pot is like. Since I neglected to photograph anything when I eventually DID share a hot pot with a few of my family members, here’s decent shot. Drooling yet? I remember watching a documentary about Chengdu hot pot: the technical skills required to make a batch of that hot pot stock or…liquid of fire, is not really above just sequencing the two dozens or so ingredients, spices, sauces and the amounts correctly, as you threw them into the burning wok of oil, with set times for each of them to cook, melt, caramelise and fry, and how to observe whether a batch is good, bad or utterly unusable. However, what’s even more interesting, is how hot pot is actually ‘eaten’: other than ordering the level of spiciness for your hot pot, the rest of the meal experience or choice is up to your own hands in ‘cooking’ them: you pick what thing you want to throw in your personal wok, and when. So, with a wok of burning liquids above a gas fire, surrounded by plates upon plates of raw foods such as uncooked red meat, seafood, potatoes, mushrooms and garlic, the experience starts when these unfinished flavours were dumped into the fiery mix with no regard for preparation nor presentation. Indifferent. 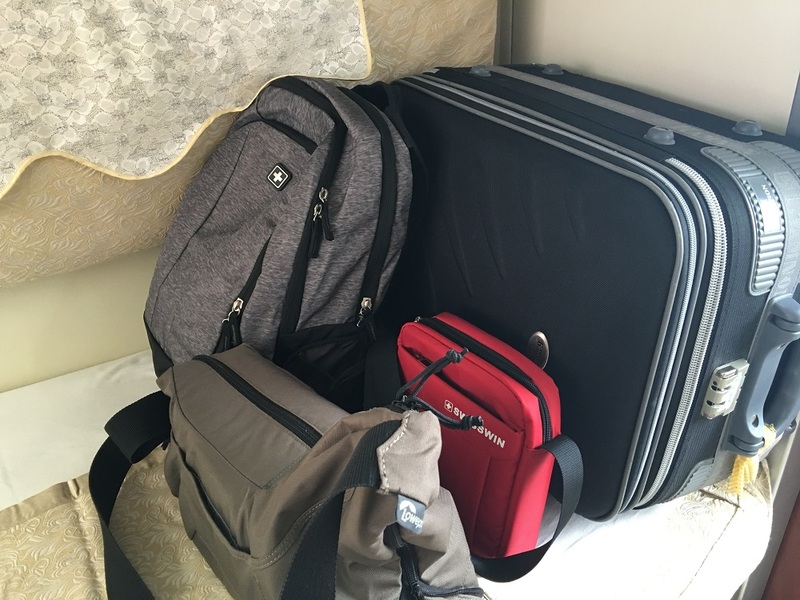 In case you were wondering: this is what I carried to the airport…a backpack, camera bag, small shoulder bag and suitcase. Too much? 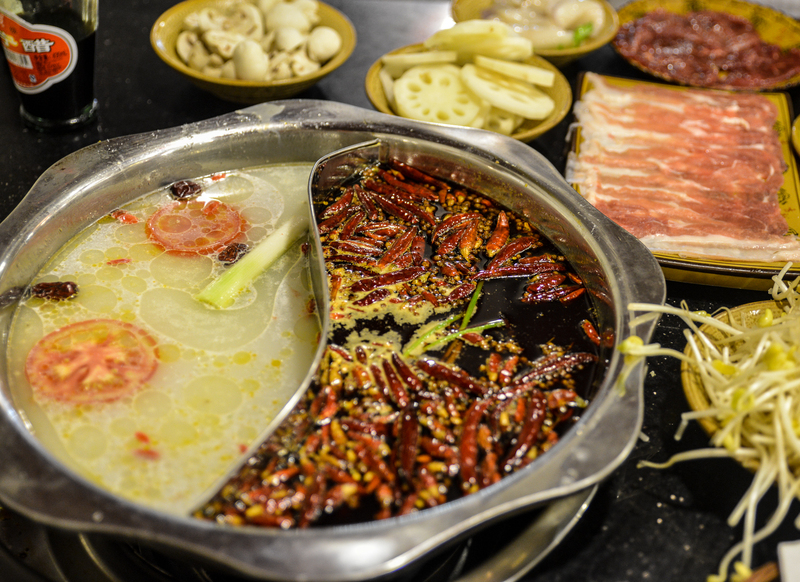 The idea of hot pot is to ‘just dump it in’, and it is perhaps the best place to get drunk, especially considering how indifferent, freeing and messy the whole set up is. If the table is still left with uneaten food or even a spot on the floor and table that’s still clean, you haven’t done yourself the service of enjoying the meal fully. I took my first steps at drinking beer during my hot pot meal with a few uncles, aunts and cousins: I downed about a litre of Tsingtao. Still didn’t get drunk. I think. Everywhere you look, specks of this personality of indifference shows itself: shopkeepers converse with their customers with relaxed indifference, after convincing them to take a look at their offerings (they aren’t shy with raising their voices, if they want their stuff gone before sunset, however): no sense of forced politeness, just a conversation. And the customers follow suit, voicing their opinions about the pricing and perceived quality of the goods with no filter (“I’ll take it for $40, it doesn’t look that premium to me.”). Bus operators doesn’t bother with policing the fare collection machines, as people piled on at each stop, seemingly trusting that the people will put in that $2 bus fare. In complete contrast to the perceived stereotype of the disciplined, well-studied Asian; whilst the school education system and curriculum (as told by my cousin in 6th grade, and her parents) are still overly reliant on memorisation, mind-based discipline and the fear of the scores below 100% (try homework loads like memorising 20 pages from a novel, ready for random recites in class tomorrow, spelling tests based on 50 random characters, 80 maths questions and a 100 word+ diary entry), the culture outside school seemed awfully relaxed. 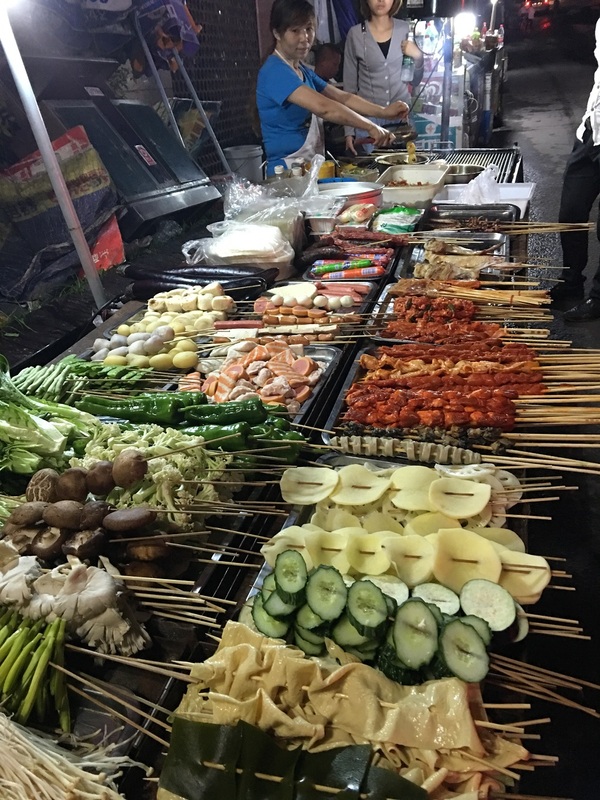 A street food stand: these are everywhere in Chengdu. You can observe the daily schedule of Chengdu with when these appear and disappear. And let me tell you: Chinese people are early risers AND later sleepers: the streets are still bustling after 11pm. “Hey! Pass my card to the front for a swipe, will ya?” Came the words. I stood at the back, where I had a full view of the bus (since there were two staircases at the back). The card and the two $1 coins was passed through no less than eight hands to get to the front, before a ‘beep!’ and the distinctive sounds of two ‘chinks’ as the coins made contact with metal. The card was then passed back to its owner. Made through no less than eight hands again. And that was the whole ordeal, and the bus operator didn’t even say a word. Indifferent. 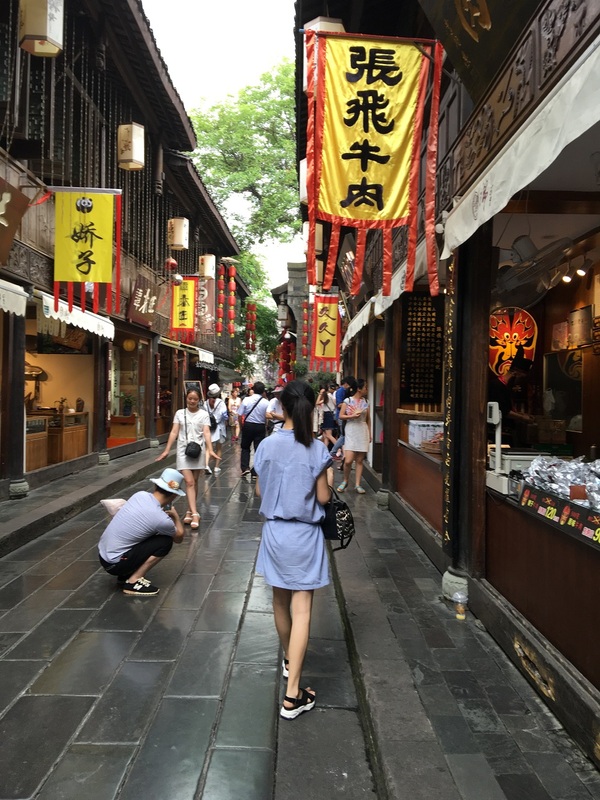 Though Chengdu’s ancient streets (some of the buildings may date back thousands of years) may be preserved, many of them are commercialised as local speciality food stands, tourist stores and tea houses. Mostly charming, but don’t ask me how PISSED I was, when I saw a charming building that was occupied by a bloody STARBUCKS logo. I am sure, that assholes are everywhere in Chengdu (they are everywhere on the planet, unfortunately), and I am sure that my experiences were probably way more decent than many others. But from what I observed, I can assure myself, that I have a very distinctive sense of nostalgic love for the city and its indifferent charms. I did grow up there. For many foreign visitors, what I described may sound alien, the service/customer relationship and the lack of commonly practised mannerisms may seem rude to you, and in some instances I’ve come across, I couldn’t agree more. During some days, the construction sites all over the city would ruin the visibility with smog, other days, during my visits to the various preserved ancient streets, I would spend ten minutes just to find a bathroom (and yes, it is just a hole in the ground most of the time, though some new buildings are adopting the more universal toilet bowl set up) But it is Chengdu’s personality. Rugged. Old. Crowded. Imperfect. Indifferent. What’s it like, eating with a Chinese Family? It may be the same for almost every culture out there, but in China, family is considered the single ‘constant’ of everyone’s lives: it is the one paramount relationship that needs to be kept alive, no matter how spread out the family blood eventually is (in my case, a few villages, cities…and oceans apart). The traditional Chinese family can range from dozens of members to perhaps even hundreds, if one were able to track down every living individual in the family tree. And this paradigm of ‘family’ couldn’t be more apparent, than watching New Years dinners, where family members all over the world gather in one place, and share in the merry celebration. And what we eat can also have some telling details about us. In some provinces, when dumplings are served as part of the Spring Festival/new years banquet (if you are wondering, dumplings are small balls of meat, shallots and/or variety of vegetables wrapped by a small paper-thin piece of dough, shaped like an ancient Chinese gold piece…bet you didn’t know that, did ya? ), one of them will contain a single whole peanut. 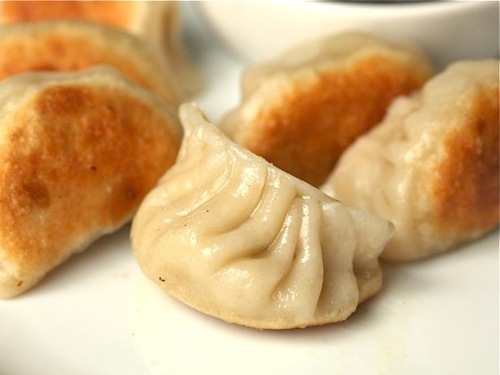 Whoever finds and eats this dumpling, is considered to be blessed for the year. I’ve heard stories from one of my aunts, that she attended one of these dinners. The dumplings are always the first things to disappear from the table. And guess what happens when the lucky dumpling was finally found? 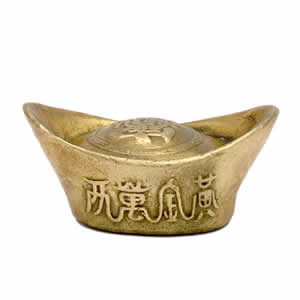 Eventually, this little piece of good fortune will find itself in the bowl of an elderly member of the family, no matter who found it, whether it be the youngest daughter, or a middle-aged father of a university-attending son: the gesture of handing food to the elders at the dinner table with your own chopsticks is a simple one, but it speaks volumes about the respect for age and wisdom in my culture, and in this case, imploring the elder member to receive the blessing is the ultimate testament of that relationship. So yes, meals with Chinese families are different to western cultures in that, each family member is usually given their own bowls of white rice, with a variety of dishes spread amongst the middle of the table, from which everyone will pick up food with their own chopsticks. Instead of set plates, where every family’s food are pre-set and separate, the Chinese meal is a communal ordeal: you eat and share the food together. If you want some other charming food-related traditions we have: we eat fish during our Spring Festival dinners, since our pronunciation of the word fish (鱼 ‘yu’. To learn how to say it: make a duck face, almost like you are whistling) is the same as ‘餘’, which means ‘surplus’ or ‘in excess’. Basically means by eating fish, we bring ourselves great fortune. Oh, and I absolutely love this one. 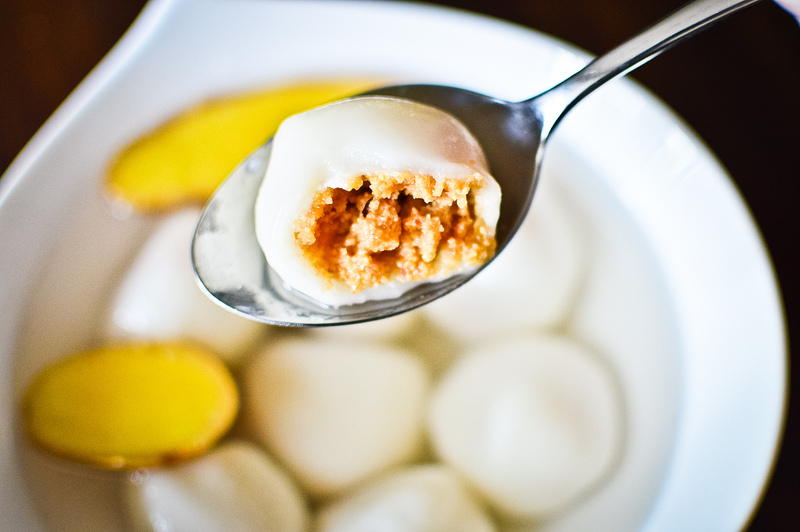 tangyuan (汤圆). You roll some sugary/sweet ingredients inside of a circle-shaped piece of dough (the filling varies across provinces and tastes: can be taro and peanut based, or can be sesame and sugar, etc), making a small sphere. What this symbolises is actually quite literal: the sweetness of being surrounded by family. Now that you know, I don’t think it would be difficult for you to guess why 汤圆 is considered the definitive dish of the new years/tuan yuan meal (团圆饭, ‘reunion meal’). I think that about covers my trip to China. Yes, half of it is me rambling about the culture, but for me, those were by far the most of what I thought about as I waited for my teeth to heal. The government’s files on me says that I am Australian, the language I speak says that I am a western. And yet, I am drawn to these fascinating flavours of China. What was meant to be a trip recount became a full-on reflection on food. I suppose there are worse ways at framing a post, but like I said, China’s culture is at its best when it is observed through the dinner table: it is loud, full of spice, crowded to the point of breathlessness. And man do I love it. Finally got around to reading all of this! I really enjoyed reading about your perspective on the culture. Feels like you’re an insider and an outsider at the same time in the sense that you have all those nostalgic memories of the city but spent so many years away from it. I wonder… to what extent does this part of China feel like a “home” to you? Or is that too personal a question? I suppose that there will always be reminders back in Chengdu; marks I made to the landscape that proved that I was there, breathed its air, and called it my home once. My third uncle’s apartment still has the piano I’ve practised on ever since I was 4, the marks I made to the wall with keychains as an infant are still there, permanently imprinted behind the book room’s door. My grandpa still has a box full of old photographs of me tucked away in the master bedroom. My old primary school is still there (God I hated that place…), and when I walked past it one evening, I honestly felt that not a single brick or slab of concrete has changed in that place. So, I guess that I will never stop thinking of that section of Chengdu as my home, even if there might come a day in a few decades when I return to Chengdu, having forgotten my mother tongue completely. Some memories simply don’t vanish.